The exhibition BIG ART constitutes Kunsthal Charlottenborg’s most ambitious and comprehensive exhibition of large-scale contemporary art to date. The show presents contemporary art integrated into architecture, created specifically for the buildings devised by Bjarke Ingels Group (BIG) throughout the world. In doing so, the exhibition focuses on art’s role in the architectural, social, environmental, political and aesthetic agendas set in projects that work with architecture and urban spaces. 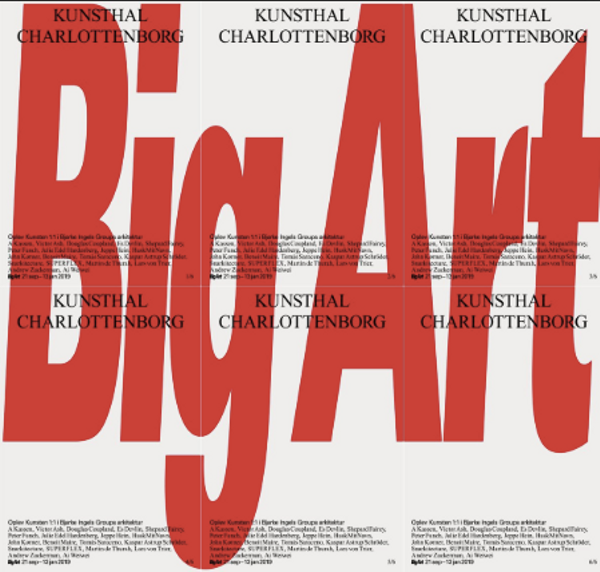 The exhibition title, BIG ART, has a dual meaning: every artist featured has been chosen on the basis of their collaboration with the architectural firm BIG – and at the same time the exhibition presents art on a large scale, showing each individual piece at the scale in which it was originally envisioned for its intended urban setting. The show transforms the 1,000m2 south wing of Kunsthal Charlottenborg into a series of architectural settings where visitors can explore BIG’s creative collaborations with a range of some of the most acclaimed contemporary artists working today: Ai Weiwei, AKassen, Andrew Zuckerman, Benoit Maire, Douglas Coupland, Es Devlin, HuskMitNavn, Jeppe Hein, John Kørner, Julie Edel Hardenberg, Martin de Thurah, Lars von Trier, Peter Funch, Shepard Fairey, Snarkitecture, Superflex, Tomas Saraceno, Victor Ash. Bjarke Ingels Group (BIG) is a Danish architectural firm founded by Bjarke Ingels. The company comprises a mixture of architects, designers, urbanists, landscape architects, interior designers, product designers, researchers and inventors working at offices in Copenhagen, New York and London. The company is currently involved in a large number of projects throughout Europe, North America, Asia and the Middle East. BIG’s architecture is created on the basis of careful analyses of how modern life is constantly evolving and changing. BIG integrates multicultural exchanges, global economic flows and communication technologies in their orchestration of architecture and urban development, working with what they term ‘pragmatic utopian architecture’ that seeks to take conventional ingredients such as everyday life, leisure activities, work, parking and shopping and mix them with art, philosophy and contemporary trends. The exhibition is curated by Michael Thouber and supported by the Augustinus Foundation, Obel Family Foundation, Knud Højgaard’s Foundation and the Danish Arts Foundation.